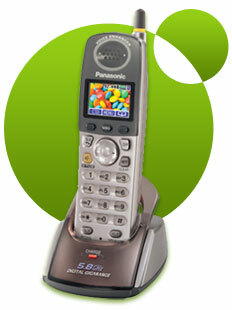 Panasonic Gigarange Telephones with Spread Spectrum Technology (SST) are clearly the next step in cordless phone technology. Cordless phones use Spread Spectrum Technology (SST) transmits over many different frequencies by using the entire bandwidth, allowing for greater output power which dramatically boosts their range. Panasonic's 2.4 GHz and 5.8GHz GigaRange Extreme SST cordless phones offer the additional benefit of twin-band transmission, for signals that won't interfere with each other. This boosts the calling range even further, and offers callers excellent sound quality every time. 2.4 GHz Frequency-Hopping Spread Spectrum Technology. That's a mouthful, but what does it mean? The 2.4GHz GigaRange technology "hops" constantly through a range of available channels to reduce interference and to provide improved security against eavesdropping. And since it is all digital technology, you get long range and incredible clarity. We've all become accustomed to Caller ID and its ability to let us see who's calling before we answer the phone. Then there's call waiting, a beep letting you know there's another call coming in. But until now, you wouldn't know who was beeping in unless you answered it. With Call Waiting Caller ID you get the best of both worlds. Now when you get a beep, you can see who's calling before you answer. The 2.4GHz phone system is equipped with an all-digital answering system for quick, easy retrieval of crystal-clear messages. Message operation has never been easier, features like pre-recorded outgoing message, remote operation, Tollsaver, and skip-and-repeat. And don't worry about losing your messages when the power goes out-they're stored in flash memory so they're unaffected by power failure or interruptions. You can put handsets all over your house-in your kid's rooms or even in the garage-without all the messy wiring or complicated setup. With the 5.8 GHz expandable phone systems, you don't need a phone jack for each additional handset-just one for the base unit. So start expanding and forget about all your wiring worries. The 5.8 GHz Frequency-Hopping Spread Spectrum technology operates on a different wavelength with much less traffic than the 2.4 GHz technology while maintaining the great security, incredible clarity and long range. Have a wireless computer network, or thinking about getting one? 5.8 GHz technology will not interfere with wireless networks such as 802.11b or 802.11g WiFi. The 5.8GHz phone system is equipped with an all-digital answering system for quick, easy retrieval of crystal-clear messages. Message operation has never been easier, features like pre-recorded outgoing message, remote operation, Tollsaver, and skip-and-repeat. And don't worry about losing your messages when the power goes out-they're stored in flash memory so they're unaffected by power failure or interruptions. Kids Sleeping? The Antenna Will Signal You Silently! This year, Panasonic's found a way to shorten the handset antenna while still maintaining the long range that Panasonic customers have become accustomed to. But what's even cooler is that the tip of the antenna - which lights up red - will alert you to an incoming call (or a message waiting for you). So turn off the ringer, let the kids sleep, and never miss a call. Having a handset speakerphone may not seem like such a big deal-until you have to call an automated phone system. By the time you press "2" and return the phone to your ear, you missed half the next option! And when they put you on hold for ten minutes, do you really need to hold the phone? Not with the handset speakerphone. Just listen along, and press a button or pick up when it's convenient. You'll think up other great uses, like letting Grandma and Grandpa listen to their new grandchild at the same time, painting your nails as you talk to your best friend, or just being able to set the phone down while you talk.